As I have mentioned several times, the infrastructure where the children’s home has become greatly overloaded. The water, electric, and the phone system is unreliable at times and getting worse. The water problems and the electric problems are related. During the dryer season, the reservoirs drop low and this reduces the water supply. Not only is the drinking water affected, but also the electric since much of the electrical generation is from hydroelectric power. The phone network is all cellular in the area. When I first started tutoring, the signal was good enough that we could connect using Yahoo Messenger and use both text and video. Now, we are only able to connect intermittently only using text due to the increased number of people using them. As amazing as it seems, you can buy a cell phone for as low as $15-18 for a basic phone and going on up from there. The other thing that happens is that the cell phones do not need to pay to have incoming calls. Once you buy a sim card, you get charged per day for making outgoing calls and texts, but you can receive calls and messages without having a load. We often see people that have a phone, or really, several family members are sharing the same phone. If a message comes in or a call is needed to be made, the search starts for someone that has a load on their phone so an outgoing call or text can be made. Eventually, we would like to put an outside antenna on the home and then have a repeater inside to give a strong signal. I had one of these at a business I was manager of a while back and they work well. Nothing can be done about the water and electricity at the moment so plan “B” has to be found. The typical answer is to put an elevated tank up that can be filled while water is available and then used when the municipal water is down. Since the children’s home is within about 7 degrees from the equator, the days are relatively equal length year around. Sunup around 6am, sunset around 6pm. New Lantern in the daylight with batteries and charger. When the power is out, the children have about an hour or so to do their homework and then it is flashlight time. I had sent some solar charged flashlights sometime back. The power outages, called brownouts there, have become more frequent. A battery powered lamp there costs quite a bit more than they do in the USA. The quality is noticeably less. 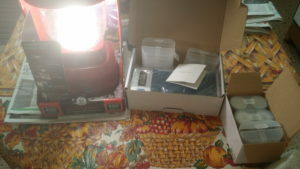 In the Christmas box I am sending, I have included a lantern, batteries, and a charger. The charger is set up for both 110 and 220 volts, which is their voltage there. I tested them to make sure that they work before packing them and was very surprised at the amount and quality of the light put out. I put it on my desk and worked in my office using it as the sole source of light for several nights. So, as the title says, “Where were you when the lights went out?” they can say, “Turning on our lantern. 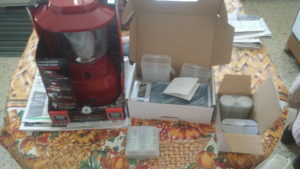 I have included pictures of the part of the Christmas shipment. The one with the light on, was taken in bright afternoon sun facing the south window. So, as you can see, it shined in the daylight.